"Los 'falsos positivos' son una práctica vieja en el Ejército"
"Desde 1994, la CIA sabía que las Fuerzas Militares colombianas tenían nexos con 'paras'"
"Mindefensa reitera que FF.MM. están comprometidas con DD. HH." "Ministro rechaza denuncias sobre ejecuciones extrajudiciales"
"CIA Documents Show Colombia Army Ties with ParaMilitary"
"La CIA y EEUU conocían de asesinatos de civiles colombianos"
"Secret Documents Show US Aware of Army Killings in 1990s"
"National Security Archive report claims CIA was aware of 'False Positives' in Colombia since 1994"
Washington, D.C., January 7, 2009 - The CIA and senior U.S. diplomats were aware as early as 1994 that U.S.-backed Colombian security forces engaged in "death squad tactics," cooperated with drug-running paramilitary groups, and encouraged a "body count syndrome," according to declassified documents published on the Web today by the National Security Archive. These records shed light on a policy—recently examined in a still-undisclosed Colombian Army report—that influenced the behavior of Colombian military officers for years, leading to extrajudicial executions and collaboration with paramilitary drug traffickers. The secret report has led to the dismissal of 30 Army officers and the resignation of Gen. Mario Montoya Uribe, the Colombian Army Commander who had long promoted the idea of using body counts to measure progress against guerrillas. The same colonel’s assertion that military collaboration with illegal paramilitary groups “had gotten much worse” under Gen. Rito Alejo Del Río Rojas, who is now under investigation for a murder that occurred during that same era. Recently, the Colombian and U.S. media have been fixated on the scandal over “false positives”—the extrajudicial killing by the Colombian Army of civilians who are subsequently presented as guerrilla casualties to inflate the combat “body count.” A still-undisclosed military report on the matter has led to the dismissal of 30 Army officers in relation to the scandal and the resignation of Gen. Mario Montoya Uribe, the Army commander who had long promoted the idea of using body counts to measure progress against guerrillas. But the manner in which the investigation was conducted—in absolute secrecy and with little or no legal consequences for those implicated—raises a number of important questions. Is yet another personnel purge absent an impartial, civilian-led, criminal investigation really enough to change the culture in the Colombian Army? And when, if ever, will the Colombian Army divulge the contents of its internal report? Amidst these lingering questions, a new collection of declassified U.S. diplomatic, military and intelligence documents published today by the National Security Archive in Washington, D.C., describe the “body count syndrome” that has been one of the guiding principles of Colombian military behavior in Colombia for years, leading to human rights abuses—such as false positives—and encouraging collaboration with illegal paramilitary groups. As such, the documents raise important questions about the historical and legal responsibilities the Army has to come clean about what appears to be a longstanding, institutional incentive to commit murder. The earliest record in the Archive’s collection referring specifically to the phenomenon dates back to 1990. That document, a cable approved by U.S. Ambassador Thomas McNamara, reported a disturbing increase in abuses attributed to the Colombian Army. In one case, McNamara disputed the military’s claim that it had killed nine guerrillas in El Ramal, Santander, on June 7 of that year. Just over ten years ago, another U.S. intelligence report, previously published by the National Security Archive, and based on a conversation with a Colombian Army colonel, suggested that the steep rise in paramilitarism during that era was related to a “body count syndrome” in the Colombian Army. This mindset tends to fuel human rights abuses by well-meaning soldiers trying to get their quota to impress superiors. It could also lead to a cavalier, or at least passive, approach when it comes to allowing the paramilitaries to serve as proxies for the COLAR [Colombian Army] in contributing to the guerrilla body count. The 4th Brigade, a traditional launching point for officers seeking to move up the military chain-of-command, has long been accused of collusion with local paramilitary groups. The Los Angeles Times reported in 2007 on a classified CIA report linking Gen. Montoya to joint military-paramilitary operations in Medellín while he served as brigade commander in 2002. 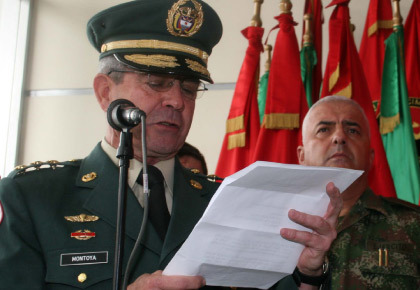 His replacement as Army commander, General Oscar Gonzalez, also commanded the 4th Brigade, as well as other units in the conflictive area around Medellín. In no case were the 4th Brigade’s paramilitary ties more evident than in a February 2000 false positives operation in which both the ACCU paramilitaries and the Colombian Army almost simultaneously claimed credit for having killed two long-demobilized guerrillas near Medellín. A declassified U.S. Embassy cable on the matter, signed by Ambassador Curtis Kamman, reported the case with shocked disbelief. So while Colombian Army officials scramble to get their “stories straight” in response to the recent scandal, it seems worth noting that “body counts” and “false positives” have an institutional history in the Colombian armed forces going back many years. And while recent steps to cleanse the Army’s ranks of officials associated with the policy are welcome, they are clearly not enough. What are the facts? Who is responsible? How long has this been happening? Who are the victims? And where are the bodies buried? Declassified U.S. documents can provide some clues, but it seems unlikely that we will learn the answers to these questions unless the Colombian Army declassifies and releases its full report on the “false positives” scandal. Until then, it seems, secrecy and impunity will continue to prevail over transparency and justice in Colombia. Michael Evans is director of the Colombia Documentation Project at the National Security Archive in Washington, D.C. The Colombia Documentation Project would like to thank the John Merck Fund for their generous support of this project. Contents of this website Copyright 1995-2017 National Security Archive. All rights reserved. Terms and conditions for use of materials found on this website.